The annual trip to Redmond for the Oregon Classic wrestling tournament always has significance for Newberg High. With more than 40 teams from around the state making their way to central Oregon, the tournament provides a preview of sorts for state competition. 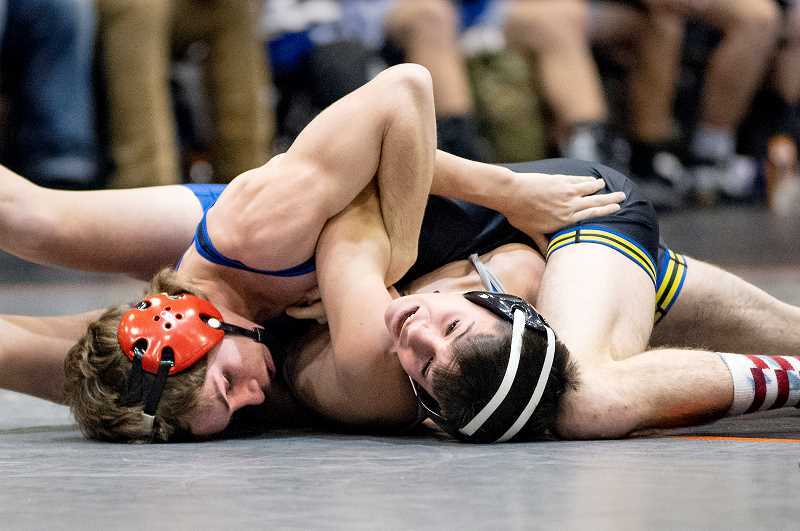 On Jan. 18-19 at Deschutes County Expo Center, the Tigers showed up and asserted themselves as the best team in the state at this point in the season, winning every dual meet in round robin pool play before finishing first in the 6A dual meet bracket. Newberg beat five-time defending 6A champion Roseburg 32-31 in the championship meet, avenging a loss to the Indians in both the Oregon Classic and state title meets last season. NHS coach Neil Russo said the teams appeared to be on a collision course as they rolled over the rest of the competition. "On day one, we wrestled side-by-side on mat one and mat two all day long," Russo said. "I'd be lying if I didn't say I had one eye on what they were doing and I know they were doing the same for us." The Tigers upended Oregon City (71-12) and West Linn (53-13) en route to the title match. Once again, strong performances at the lower weights – particularly by freshmen – carried Newberg throughout the two days of competition. Both Newberg and Roseburg had three falls, but the Tigers' two major decisions – compared to the Indians' one – ended up being the difference. The championship meet came down to the 285-pound bout, where Newberg's Connor O'Bryan beat Roseburg's Hunter Blix on a 6-4 decision. Russo said Hunter James "worked his tail off" to get a major decision victory over Hunter Hillard at 220 pounds, and that Ayden Garver's victory over Nash Singleton at 113 was the highlight of the weekend. "It was as good a high school match as you're going to see," Russo said of Garver-Singleton. "When you throw in the fact that they're both ninth graders, it makes it that much more impressive. It was high level wrestling." Freshmen have played a key role in Newberg's dominance this season, anchoring the early portion of its lineup and providing depth across the board. Depth could prove the difference come state championship time in March, and Russo said Roseburg is among the teams that can match up to the Tigers in that category. Other teams to look out for in the postseason, he said, include Mountain View, Sprague and West Linn, among others. Those three teams – along with Newberg and Roseburg – boast some of the most dangerous lineups in 6A. "Dual meets are so much about matchups," Russo said. "You can have five or six outstanding individuals and really not be a great dual meet team. You can also have no outstanding individuals but 14 solid weights. I think we have a combination of both of those things and that's why we've been successful." Newberg hosts its final home meet of the season Thursday against Century. After celebrating its seniors with what should be another dual meet victory, the Tigers will be at Liberty High in Hillsboro on Friday and Saturday for the Resers Tournament of Champions. Russo called it the "premier individual meet in the state."